It is the busy time of year here in Mahahual, and I am way behind on the blog. I have been working the cruise ships during the day, and I have been socializing with people down here visiting or looking at real estate at night. Because of this, my days are pretty full now, and it seems like every time I sit down to write a blog something comes up. But I am not complaining, I will have plenty of time to catch up on the blog during low season. I am meeting a lot of new people from all over the world visiting Mahahual, and of course meeting a lot of people off of cruise ships as well. So today I thought I would write a blog about some of the interesting people I have met recently on the malecon. The thing that is different about this post is, these are people who are not on cruise ships, and a bunch are readers of this blog who are visiting or living in Mahahual during the winter months. I am very surprised at the amount of people who have come up to me lately and asked me if I was Stewart, the guy from South Carolina who writes the blog. There is not day goes by that someone does not come to me and talk to me about this blog. The other day I had a woman walk by below on the malecon with her husband, and yell up to ask if I was Stewart, the blog writer. I said yes, and went down to meet them, they are from Minnesota. They were supposed to come back and give me their names because I have a photo of them. She asked me where were some of the places they could eat at that I have mentioned on the blog in the past. I took and introduced them to Rosa, my cook on the malecon, who makes some of my meals. (I had fish stew last night for 50 pesos, great, had about 10 shrimp, half a crab, and fish) Here is a photo of them below. Note…Their names are Mike and Rose Decklever, I ran into them last night and got their names. Blog readers from Minnesota, eating at Rosa”s place for lunch.Rose and Mike Decklever. I think they come to Mahahual every year, and they own property here. I am sure I will see them soon, so I will edit this later when I get their full names. I have to write people’s names down now, because I meet so many people I cannot remember all their names. I remember what state or country they are from, but names escape me sometimes. In fact now we have a Tropicante Steve, a Minnesota Steve, an Aussie Steve, in town, so I try to remember that way. All American names sound alike to me anyway now. One story I have to relate, as an example of the people I meet sometimes. About a month ago, I remember it was a rainy Thursday on the malecon. Business was slow, and I was sitting inside out of the rain at the Tropicante. I had a long couple of weeks showing people around, and going back and forth between Mahahual and Playa del Carmen. I had a stuffy nose, and I did not feel all that great, and I had been outside all day in drizzle, and off and on rain. Well I was sitting there, and the next thing I knew this wet Asian woman came up to me in the rain and asked me if there were any rooms to rent at the Tropicante. What struck me was she had an English or London accent, and looked Asian. I told her no, that the Tropicante was a restaurant and only opened for cruise ships. She then told me, she and a friend were new in town, and they were looking for a room for the night. She was wet and cold I could tell, so I thought to myself, should I get up from my chair and help this woman find a room in the rain, or play dumb, or just blow her off and be rude and say I don’t know. Problem is, I know every room and hostel in town, that is part of my job. So being the southern gentleman that I am, I got up and told her let’s go, I will find you a place to stay. I started off on the cheap route by showing her a couple of hostels. She was not interested in a dorm hostel, for a night, and she needed something more private. So we walked around in the rain, and I showed her a couple more hotels, and she finally decided she liked Ponchamama’s right off the malecon. She got a nice room, I think for around 600 pesos, and the room was very nice. So her and her friend got the room for the night, and I think they even stayed an extra night. The next day she came by and thanked me, and called me “Her Knight in shining armour”, in her English accent which sounded pretty cool to a southern guy like me. I helped her plan her next trip south to Bacalar, and I think they headed west, and then ended back in Cancun before flying back to England. She is now a Facebook friend, and I think she reads the blog. Julie Wong, the Asian-English damsel in distress, who I helped in the rain. I also met another very interesting blog reader a couple of weeks ago, here on the malecon. I was sitting there at my chair, and a guy walked up to me and asked me in an Australian accent, if I was Stewart who wrote the blog here. I said yes, and he told me he is from Australia, and he reads my blog. Now I have noticed on my blog that I get some readers from “Down Under” sometimes, so I told him, “So you are the guy from Australia, who reads my blog”. We got to talking, and he and his wife packed up everything in Perth, Australia, and took off to see the world. They have been traveling throughout Mexico, and the western USA, and stopped in Mahahual to check it out. He and his wife both are writing blogs and taking photos of their world tour. To see their blogs and photos go to http://www.stephenmanning.com.au and http://www.sharonmanning.com.au. I have seen some of their photos, and they are quite good. I think they had planned on staying on one week, but like so many others who come to Mahahual, they have extended their stay, and have been here two weeks or more. They are heading next to Tulum, and then Cuba, I think. “Aussie” Steve comes by almost every day, and I have learned a lot about Australia from him, nice guy, and I love his accent. “Aussie” Steve on the malecon. Great Outback hat. They are traveling through Mexico looking for a place to retire away from the snow and cold weather of Canada. They told me they like Mahahual because it is quaint, far away from mass tourism, and a lovely paradise. 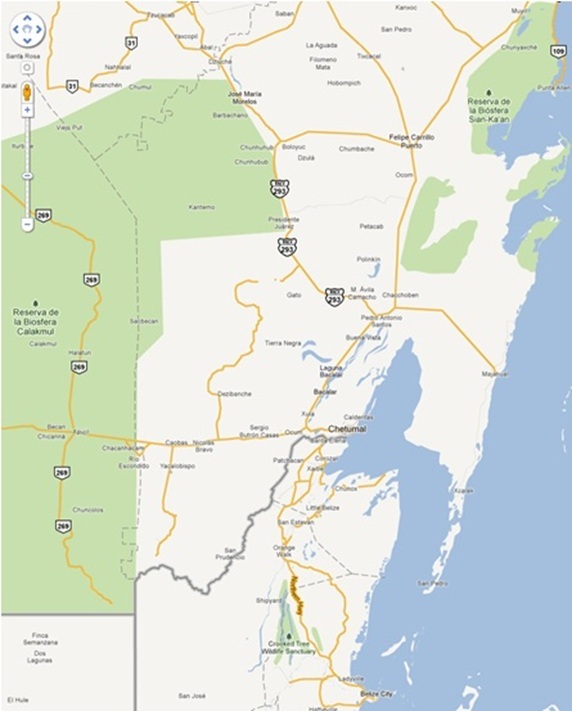 If they decide on the Caribbean, they want to live in Mahahual, but first they want to check out the west coast of Mexico. I got a weird feeling they will be back. Blog readers, Peter Coniff and Sandy Smith-Ross from LaCrosse, Wisconsin, and Shannon Cash from Deerfield Beach. They are down staying for a week, Pete and Sandy come down a lot. The other day, I was sitting on the balcony, and I looked down and I saw a guy who looked lost. This guy seemed out-of-place, he had real white skin, and he was wearing a hat that was way too big for him. I noticed he was looking at the town map, and looked confused. I thought to myself, another lost tourist, because he looked real out of pace. So being the guy that I am, I shouted down to him if he spoke English or Spanish, I already knew the answer. He said he only spoke English, and said he was looking for an ATM machine. I pointed down the malecon to the dive shop that I knew had a working ATM machine, and told him to go there. I watched him walk away, and he got halfway down the malecon, and he was surrounded by taxi cab drivers. I said to myself, Hell I better go down there and show him, or the taxi cab drivers will be driving him to Chetumal or wherever for an ATM machine, and it might cost him a lot of money, because he spoke no Spanish. So I walked down there and shooed the cab drivers away, and took him to the dive shop so he could get some money. Come to find out he is an Episcopal priest from Taunton, Massachusetts, and he is here for a week on vacation. He thanked me, and I have seen him walking around on the malecon almost every day since he has been here. He always stops and says hello to me when he sees me, nice guy. So lately, I have saved a “Damsel in Distress”, and helped a man of the cloth, find an ATM. The Rev. Dr. Richard Bardusch, an Episcopal Rector on the malecon. These and many others which I have not listed here are some of the examples of people and events that occur on the malecon for me in Mahahual. The Crossing Borders Festival starts this week, here is an article from http://www.costamayamagazine.com with all the details. Thsis article is translated from Spanish. It is anticipated that in the event an agreement is signed Turissste and Mahahual. Chetumal, Q. Roo.- Tomorrow, Costa Maya entrepreneurs and officials from the three levels formally announced the start of the third festival Crossing Borders. The president of the Foundation Mahahual and event organizer, Luciano Consoli, reported having a reservation of 90% and hope to reach 100% occupancy. He said it will announce the schedule of activities has been prepared for the event at a press conference. “This year there will be many surprises in the Festival, will begin with a welcome dinner for just over 100 artists at the cruise ship dock. The opening will be on Saturday 28 in Mahahual and from there throughout the week we will have activities from 8 in the morning until night, “he said. Luciano Consoli made the invitation to the general public to attend, participate and enjoy the Crossing Border Festival 2015, which this year will feature special guests from Mexico, Italy, Argentina, Cuba United States, Germany and Spain. He said Francisco Céspedes, Yerbabuena Kajahla, Cuevo and Band, Xelba Sound, David Rotundo, Reyna, Mahamole and Friends are some of the musical artists who will be participating, but also be writers, composers and artists. He said that last week in Mexico City a presentation of the event, which had a good response was made. At Silver Reef they make their own jewelry, and it comes with a trademark, letter of authenticity and quality certificate. They only sell the finest quality .925 and .950 silver, the best you can get. There is no sales person, so you deal direct with the owner, to get the best price. The shop has been here since the port opened, and they get a lot of repeat business from cruise ships. You can even design your own jewelry and they can make it for you. Their prices are about 50% less than the port prices. The silver’s purity they sell is protected by law. They also have a Mayan gift shop where they sell gifts, pottery, and other Mayan related articles. So if you are visiting off of a cruise ship or are in town for vacation, stop by and take a look inside. Best deal on the malecon. They even have a University of South Carolina plate hanging up in the store. I did not put it there, I swear. There is an increase of 23 % this year, 2015, of cruise ship tourists to Quintana Roo, Cozumel and Costa Maya. Here is an article from http://www.costamayamagazine.com . I translated from Spanish. We have sure been busy in Mahahual lately with cruise ship tourists. 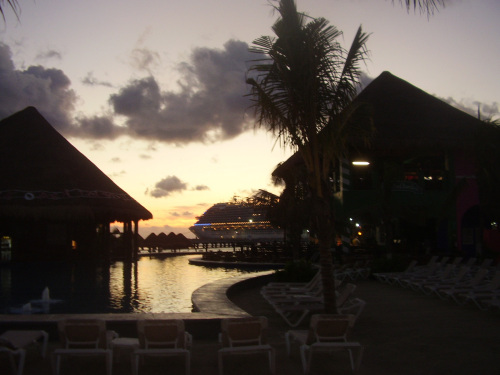 Dawn at Costa Maya Port. Chetumal.- Up to a million more tourists arrive this 2015 to destinations in Quintana Roo on the previous year, said Thursday the governor Roberto Borge Angulo, while in Cruise, just this past January and is recorded increase of 23 percent, explained Ercé Barrera Barron, head of the APIQROO. The state governor Roberto Borge Angulo, said that for this 2015 an increase of between 600,000 to one million tourists in Quintana Roo over last year is expected, due to the upturn in bookings foreign and domestic vacationers following the Time changes and tourism promotion. He said the continued involvement of Quintana Roo in tourism fairs and flea markets that have been made in Mexico, abroad and the largest number of air connections there with the time zone meridian 75, have also been key factors for increasing more tourists visiting the destinations of the state. He stressed that this will have to be tapped, so consider that this year will be higher profits for the local tourist market. He said that so far this year there has been a noticeable improvement for cruise tourism sector is expected that at least this will continue until the first half of the year. He said Quintana Roo prepares to participate in the meeting to be held in Miami where managers and shareholders of major shipping companies in the world, where we will seek to establish strategies to take advantage of new cruise lines and their respective potential in economic matters will meet. People are discovering this everyday here off of cruise ships. I thought I would reblog this for new readers. Holly and Ron May, Ohio State fans here in Mahahual. Their fathers, and Kelly also is in photo. I thought I would put their phjoto first since they won the NCAA football championship. Big fans here off a cruise ship. They spent the day on the beach here at the Tropicante. Me, with Robert and Jodi Mello, Gamecock fans from my hometown, Greenville, South Carolina. Notre Dame fan, even had ND socks on. Me, with some Michigan State fans. Duke footbal fans, all decked out. 2 Texas A&M fans, with Steve Uhl, owner of Tropicante, a U of Texas grad. Here I am with the Burton clan from Easley, SC. Nice family and Clemson fans, they enjoyed themselves on the beach here. My first North Dakota State sighting. Great football program, this woman is in the marching band and is currently attending the college. Me and a Clemson fan, he had to run up to me and show me his shirt after they beat us this past year. Furman student here on a cruise ship. Furman is in my hometown. More Gamecock fans, Dwayne and Lynia Ard from Columbia, SC. I meet a lot of college footballs fans in Mahahual on the malecon from all over the USA. Here are some photos that I have taken lately of fans wearing their college hats and shirts here. The story begins in Xcalak Costa Maya and dates back to pre-Hispanic times, with 16 archaeological sites that have been discovered between Punta Herrero (south of Bahia, Holy Spirit) and Boca Bacalar Chico. 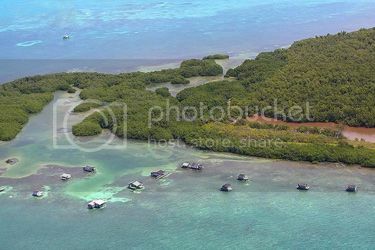 Seven of these sites are located between Punta Gavilan (just north of Macaw) and Boca Bacalar Chico, on the border with Belize. In the 16th century, the English pirates took over much of the coast and attacked Spanish ships carrying gold and riches to Spain. Spain tried to defend their interests by building strong forts, like Bacalar, but the pirates continued to ravage the region, with the intention of taking over the entire peninsula in the name of the British Crown. The kingdom of pirates lasted until the late 19th century, due to to indigenous rebellions and neglect in the region.